Viamistad hosts camp week experiences in Guatemala that provide freedom, purpose, recreation and authentic relationships. In the summer of 1998 I volunteered at Camp Jabberwocky, Martha’s Vineyard, Massachusetts. Founded in 1950, it is the oldest summer camp in the U.S. serving the disabled. 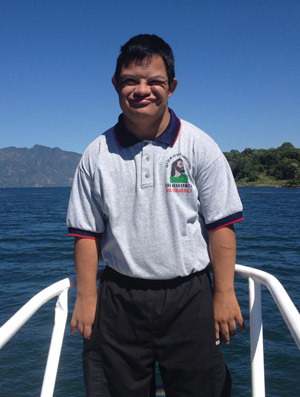 Juan from Santiago Atitlan has attended Camp Kikotimaal off and on since its first session in 2005, when he was a little boy. 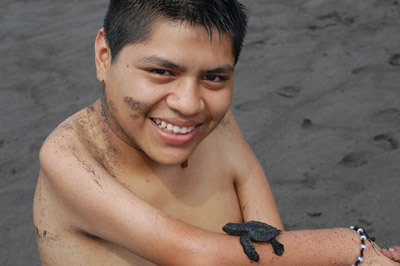 Pictured here at the beach in 2014, he lets a baby sea turtle crawl up his arm before liberating it into the sea. Everyone needs freedom, purpose, recreation and authentic relationships that are based on mutual enjoyment and sharing. People with severe disabilities, typically dependent on families or societal charitable institutions for their basic needs, frequently lack opportunities for formal education, mental stimulation, authentic friendships and self-direction. All too often institutions focus only on the disability such as offering physical therapy, but, education and social opportunities go by the wayside. Volunteering for years at Camp Jabberwocky changed the trajectory of my life. The idea of starting a camp in Guatemala was obvious. In 2014 Campamento Kikotimaal celebrated its 10th year bringing together mostly the same group, and we created the nonprofit organization Viamistad to host the camps. Camp Kikotimaal: Adapted soccer gets rough at camp in Santiago Atitlán. These players have been coming to camp for over 10 years. 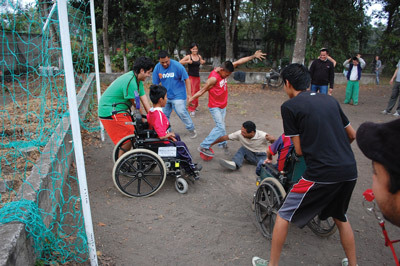 We have also expanded into three camps to invite many more people with disabilities to join us. Many camp participants had not previously left their homes—ever. Others live in institutions and receive only basic survival needs. There are many disabled campers who have overcome tremendous challenges and actually began programs for the disabled in their communities. They’ve made inroads into accessibility, inclusion, travel, activism, special education and access to therapeutic resources. 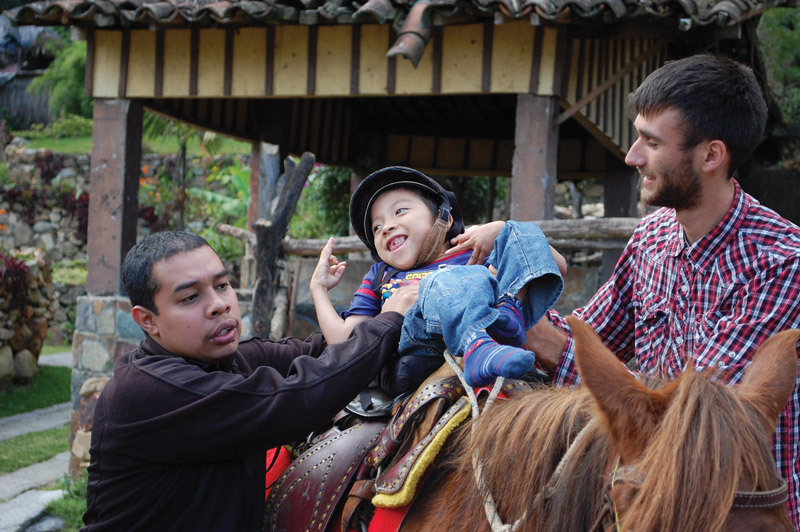 Working in the disability world in Guatemala for over 10 years, I have seen firsthand the transformation in special education programs and even a few new vocational programs for adults along with much greater visibility and heightened awareness. 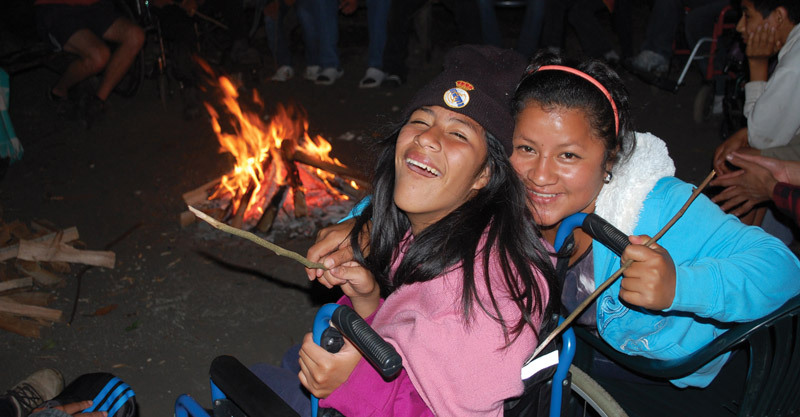 Paola and Maria José are reunited for their second year at Camp Wixb’iil. They roast marshmellows together during the first night of camp. Lifelong friendships are created and sustained during the camp season. We strive to create opportunities for new experiences, travel, adventures and working together on projects. 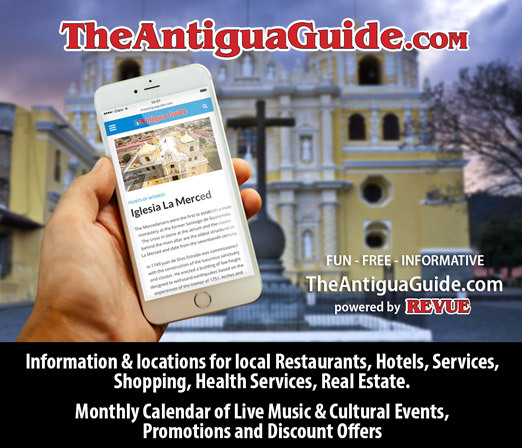 We play music and sing, do yoga and sports, play games, swim, visit tourist destinations, ride horses, enjoy art workshops and collaborate to create a unique theatrical performance, which we present to parents and the community. We spend a week at the beautiful Lake Atitlán and a weekend enjoying the beach on the Pacific Coast of Guatemala. Mishel from San Martin Chinautla and Jose Carlos from Pastores, at their second year at Camp Wixb’iil. Camp is a magical place for campers and counselors alike, where money does not change hands and divisions between social class, ability and culture fade as everyone contributes his or her unique talents and personalities. There is no staff, no clients. In fact, we are trying to stop using words that differentiate camp friends by whether they experience a disability. We do not want to become another institution. Everyone is invited to return year after year. No one is paid or pays to attend camp. The most important thing about camp are the relationships formed there. 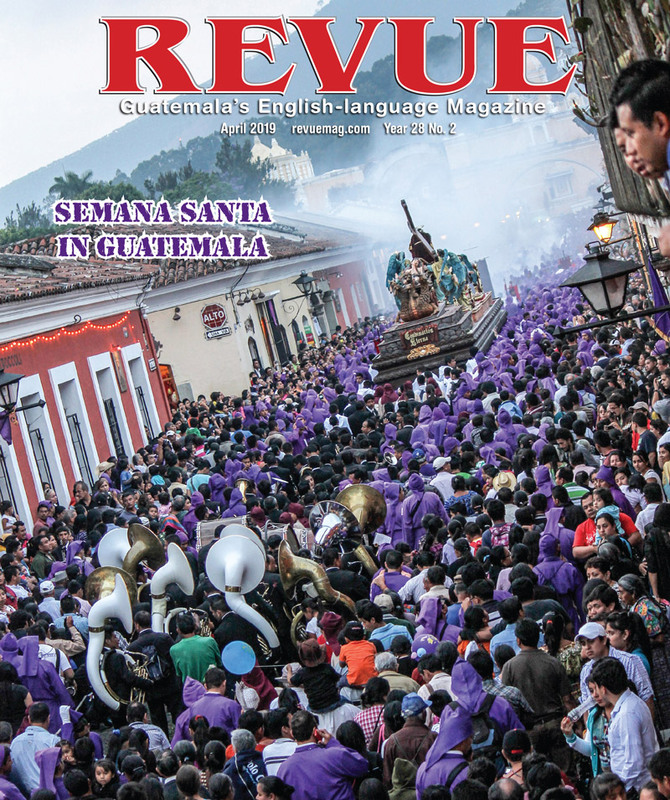 Sabrina Reppert wrote an article for the Martha’s Vineyard Times after spending months in Guatemala and coming to three camps. During her second year at Camp Achik’, Gaby, 24, nonverbal with autism, made a strong impression on Sabrina. “Over the days, Gaby and I developed a deep bond,” she wrote. We have a call out for volunteers who can dedicate a week or more during November and December, in particular people with artistic talents (music, art, dance, theatre) to share. Also, we depend entirely on private donations to support these camps. Any contribution will be most appreciated. Glenda from San Gaspar Vivar, hold up a mural they made at Camp Wixb’iil in 2015.